Established in 1997, LookInTheAttic is a privately held trade site based in the State of Michigan. Offering a wide variety of online sales and services, the name of our company provides our reason for being - a passion for customized vintage reproduction hardware. Most of our products are modeled after the types of hardware found stored away in attic trunks or stored in salvage warehouses. Our staff has developed a comprehensive catalog of hardware and glassware items representing a variety of items designed during the major furniture style periods, including William & Mary, Queen Ann, American Colonial, Chippendale, Louis XVI, American Federal Period, French Empire, Victorian, Art Deco, California Modern, Machine Age and many others. As a company, we measure success in the traditional manner. Our online store has become one of the largest retailers of reproduction and vintage hardware through catalog sales and phone sales. We re-manufacture or custom design beautiful hardware pieces that cover the gamut from rustic to traditional to ultra-modern and can boast over 3.5 million website visits annually. We also operate a design center specifically geared towards Architects, Designers, Contractors and Specifiers. LookInTheAttic was recently accepted into the NYSE Big Start-up venture and we are a Dun and Bradstreet listed company. LookInTheAttic also measures success by the expertise of its staff, the level of customer satisfaction created, the quality of its products and a corporate culture that promotes creativity and innovation. It is why the company continues to grow and attract worldwide recognition as a major source of crafted metal and glass hardware of all types. Customers can order out of the catalog, but they also have the option of ordering custom made hardware to replace missing pieces, add stylish details to new construction or upgrade existing hardware on furniture or in the home or business. The hardware selection includes common usage items like door knobs, drawer pulls and hinges. However, LookInTheAttic also offers hardware items that are installed to add finishing touches, like door knockers, metal switch plates, metal mail slots and garden latches. Customers needing assistance are pleased that we offer easy access to knowledgeable consultants, and have found this to be a refreshing change. Customers can talk to human beings who have in-depth knowledge about hardware, including types, styles and applications. The efforts of the highly skilled staff at LookInTheAttic have earned the company numerous rounds of applause. In 2009, the company was an Award Winner of the Edward Lowe Foundation, earning honors as one of the Michigan 50 Companies to Watch. The company also earned the New York Stock Exchange Big Startup Award, and was ranked as one of the Top 10 Business Moves by the Ann Arbor News. LookInTheAttic is an industry leader and recognized hardware expert. As a result, the company has been a source for numerous magazines that include the influential This Old House Magazine, Better Homes & Gardens, Romantic Homes, Victorian Homes, Country Living and House Beautiful. It has also been sourced or featured in a variety of news articles and TV shows that include the New York Times and Home and Garden Television. The applause really goes to the customer service consultants and craftspeople who design and produce our exceptional hardware pieces. They are the ones who have brought our company distinction and honors. Customers can visit online at www.lookintheattic.com or you may also send us an email at customerservice@lookintheattic.com. 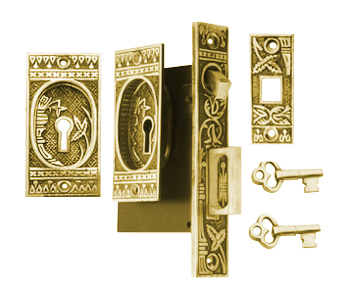 LookInTheAttic is pleased to offer a complete line of visually stunning hardware that is made to endure the test of time, just like the original pieces. lookintheattic® and the LookInTheAttic logo are Registered Trademarks of LookInTheAttic & Company, Inc. SilverAndGold.com®, CopperMountainHardware™ and PeriodStyleHardware.com® are trademarks for LookInTheAttic & Company. D&B logo is a registered trademark of Dun & Bradstreet.